Home bars with luxury Christofle silver and Baccarat Crystal. Set includes: ice bucket, four double old-fashioned glasses, and nickel-plated tray. Non leaded crystal glasses and ice bucket. Set includes cocktail shaker and four double old-fashioned glasses. Nonleaded faceted crystal. Stainless steel lid. Set includes: mini bar cart holder, bottle opener, double jigger, stirring spoon, ice tongs, ice bucket, and four Tom Collins glasses. Handcrafted martini set. Soda glass and stainless steel. Set includes two martini glasses and one shaker. Etched and glazed crystalline Who says bars are for the boys? We say they are for the bees! Sometimes you don't always finish the bottle. Use our sparkling bee to save the buzz for later! Never has a cocktail pick been more glamorous. Use these for all occasions and just 'bee' fabulous! Coasters made of glass beads on cotton backing. Glass. Sets of 4 The sparkle bee continues to be a love and in this rich emerald, it can work in Spring or for the Holidays Glass barware with golden decal decoration. Set includes one of each design. Sold individually. No two are exactly alike. Stone. More colors Gather by Anthropologie is an exclusive curation of everyday essentials, from our table to yours. Here, our Lustered Glassware Collection boasts impeccable, thoughtful design, complete with an elevating, iridescent finish. Coasters have embossed-shagreen finish. Ringed in gold-tone brass. Suede underside. Organized in a round box. Relax at the end of a long day, and enjoy a glass in this set. The glass lets you easily see the content level of your favorite beverage, and comes in a set of four, which is ideal for intimate gatherings. La Rochere's Versailles Double Old Fashioned glasses are elegant and sturdy. Perfect for water, ice tea, beer or cocktails, the design is inspired by the baroque splendor and magnificent gardens of the Palace of Versailles. Steeped in tradition La Rochere is the oldest glass factory in France. Relax at the end of a long day, and enjoy a glass in this set. The glass lets you easily see the content level of your favorite beverage, and comes in a set of four, which is ideal for intimate gatherings. Relax at the end of a long day, and enjoy a glass in this set. The glass lets you easily see the content level of your favorite beverage, and comes in a set of four, which is ideal for intimate gatherings. Relax at the end of a long day, and enjoy a glass in this set. The glass lets you easily see the content level of your favorite beverage, and comes in a set of four, which is ideal for intimate gatherings. Relax at the end of a long day, and enjoy a glass in this set. The glass lets you easily see the content level of your favorite beverage, and comes in a set of four, which is ideal for intimate gatherings. Definitely one of the most commonly used instruments behind the bar, the cocktail shaker is used to mix ingredients and to rapidly chill beverages. A cocktail shaker filled with ice will bring a liquid to almost freezing in a matter of seconds when shaken vigorously. There are three basic types of cocktail shakers. The most traditional are the three-piece shakers, consisting of a tumbler, a tight fitting perforated lid (for straining) and a cap that covers the strainer. Bar tool set made of mango wood and aluminum. Wood base features metal inlay design. Set includes stand, strainer, double jigger, bottle opener, fruit knife, and mixer spoon. Based on the timeless elegance of French champagne buckets, this radiant collection brings the style and practicality of professional bar tools into your home. Handcrafted tumbler. Lead crystal. France Handcrafted cocktail glass. Handcrafted highball. Approximately 3"Dia. x 5.5"T. Crystal. Hand wash. Made in France. Handcrafted highball glass. Approximately 3"Dia. x 5.5"T; holds 11.5 ounces. Lead crystal with gilt accents. Hand wash. Made in France. Handcrafted crystal decanter. Holds 23.6 ounces. 4.7"Dia. x 10.1"T. Hand wash. Made in France. Handcrafted crystal tumbler. Holds 11.2 ounces. Handcrafted large Oxymore double old-fashioned in sky blue. 3.9"Dia. x 3.9"T; holds 12.8 ounces. Crafted of crystal. Hand wash. Made in France. Handcrafted Oxymore cocktail shaker in clear. 3.3"Dia. x 8.5"T; holds 12.3 ounces. Crafted of crystal. Hand wash. Made in France. Handcrafted tumbler. Lead crystal. Glittering Baccarat crystal barware adds an element of glamour to every cocktail. Made in France. Handcrafted full-lead crystal from Baccarat. Holds 26 1/2 ounces. 12 5/8"H. Consecutive parallel cuts travel cleanly along the Clear crystal, grazing the tumbler from its lip all the way down to its thick base. 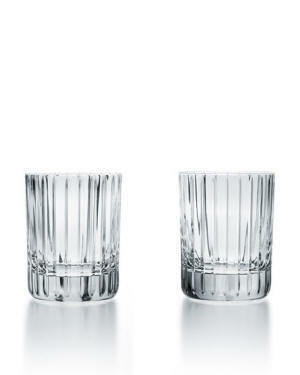 These lines emphasize the verticality of the tumbler as you sip your quality spirits and mixed drinks. Set of two handcrafted lead crystal triple old-fashioned glasses. Each holds 17.6 fl. oz. 4.8"T. Consecutive parallel cuts travel cleanly along the clear crystal grazing the tumbler from its lip all the way down to its thick base. These lines emphasize the verticality of the tumbler as you sip your quality spirits and mixed drinks. The vertical sweep of the striping is also present on other pieces of the Harmonie collection, which includes highball glasses and a round whiskey decanter. Handcrafted single old-fashioneds. Set of two. Lead crystal. Handcrafted ice bucket. Full-lead crystal. Handcrafted Harmonie on the Rocks bar set. Glistening ribbed crystal. Ice bucket, 4.875"T; holds 1 liter. 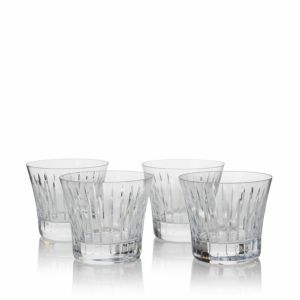 Includes 4 double old-fashioneds Handcrafted full-lead crystal from Baccarat. Holds 30 2/5 ounces. 9 5/8"H. Hand wash. Made in France. Handcrafted barware. Full-lead crystal. Made in France. 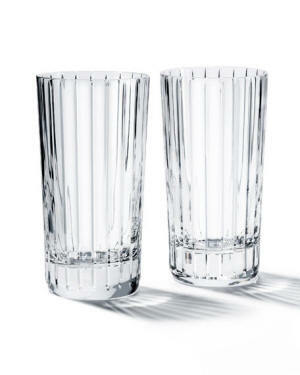 Set of two handcrafted highball glasses. Each holds 12 ounces. 5.5"T. Lead crystal. Four-piece assorted glass double old-fashioneds set. Bring timelessly elegant style to the table with this exquisite cut crystal glassware from Baccarat. Six-piece set of assorted tumblers in a beribboned gift box. Lead crystal. Six-piece set includes one of each design shown. Each measures 3.375"T and holds 6.75 ounces. Made in France. Highballs made of lead crystal. Set of two; each measures 5.5"T and holds 12 ounces. Made in France. Baccarat: A long-standing tradition of excellence in exquisitely crafted crystal and glassware. Baccarat: A long-standing tradition of excellence in exquisitely crafted crystal and glassware. Lead-crystal martini glasses. Set includes one of each color shown. Made in France. Designed by Savinel & Roze for Baccarat. Handcrafted tumblers. Full-lead crystal. Handcrafted decanter. Full-lead crystal. Vega crystal martini glasses by Baccarat. Handcrafted decanter. Lead crystal. Approximately 4"L x 3.75"W x 13.75"T. Hand wash. Made in France. Whether around the bar or invited to your table, Facet's contemporary take on Deco glamour will steal the show Lalique’s renowned 100 Points collection has expanded from a single universal tasting glass to an entire assortment perfect for a wide variety of beverages and occasions. Designed in collaboration with international wine critic James Suckling, each glass in the collection is carefully finished, sanded and polished for incredible clarity and beauty. Typically 8-10 oz. Signature drinks: Whiskey, scotch, drinks served “on the rocks”, shots mixed with juices. A low profile heavy glass, the old fashioned glass (also known as a double old fashioned, lowball, or DOF) is one of the must-haves for any bar. Most commonly used for straight alcohol “on the rocks". Typically 8-10 oz. The highball, or Collins, is usually used for ice-filled drinks that contain fruit juices or soda. It is tall and slim, making it a great glass for presentation of colorful mixes.